I play mahjong. It’s true. I know I’m a bit younger than the average-aged player (though I’m not sure why it trends that way! 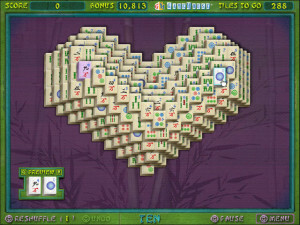 ), but I love my weekly mahjong games. I play with a group of women every Sunday afternoon, and I always come with my shiny pink “I love mahjong” pouch filled with quarters. Why quarters, you ask? Because we gamble, too. I once made out like a bandit, winning an all-time high of $3.75! One of the reasons I love the game so much is that a large part of it is based on skill. You have to figure out which hand (like in rummy) makes the most sense with the tiles you’re dealt, and then you have to strategically acquire the rest of your tiles to complete the hand. (If you have no idea what I’m talking about, just bear with me for another minute or so.) You need to use methods that have worked in the past, you need to practice to better your skills, and you need to play pretty often to stay at the top of your game. But, what if, after all of that, you still can’t win? At that point, you just have to resign yourself to trying again next time because the rest of the game is up to timing, chance, and luck. Sometimes you’ll have those working in your favor, and other times things just won’t go your way, no matter how well you played. Of course, though, just like in mahjong, sometimes you’ll write that witty email, tweak it a few times, and send it into the online abyss, only to receive nothing in response. Even though you’re devoting the time and giving it your all, sometimes things just won’t go your way. As hard as it may be, try not to take it personally. There could be any number of reasons why someone doesn’t respond—you look like an ex, she’s on vacation, the email got lost in the inbox, or he just didn’t like your hair—but that’s okay. Get back on the horse and try again because you’re bound to win your quarter… ahem, date… eventually. We can do everything in our power to be the best we can be, either at mahjong or the online dating game, but in the end, timing, chance, and luck will play somewhat of a role in the process. Don’t let it get you down. If anything, it just means that you’re primed for a win (or a date) the next time. ← Is “Manning Up” the Answer? Strange that you would make a New Year’s resolution to watch More TV while I made the resolution to never watch TV again, consequently, I will never be able to recommend a favorite show to you or by the looks of it, never publish a book (not enough TV watching, I suppose). But I will make your book signing and congratulations. Well … it means that mathematically. But in dating & relationships, people’s biases can interfere to skew the results in ways that I’d submit don’t exactly happen when you’re dealing with the mahjong tiles.